My love for anthuriums started at a young age when watching my mother planting them in wood chips, coconut husk and rotting cocoa pods. The anthurium is one of my many favourite plants, not only is it spectacular to look at but also attractive. 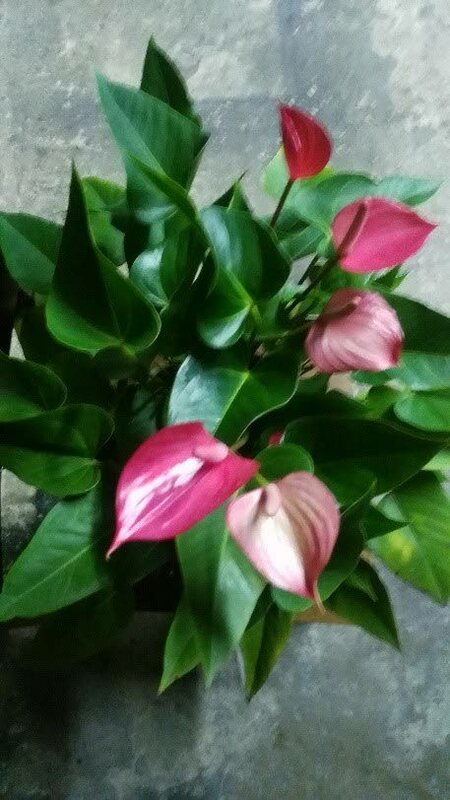 I started planting anthuriums after visiting my friend’s parent’s estate in La Laja and was given a few plants of the local pink variety. These were the ones they would harvest and sell at the Arima market. Since then I have been planting anthuriums. Anthuriums are herbaceous epiphytes native to tropical America. Anthurium is a genus of more than 800 species found in the New World tropics from Mexico to northern Argentina and Uruguay including the Caribbean. The anthurium is also known as painted tongue, flamingo flower (flamingo lily) or tail flower. They are grown for their brightly-coloured flower spathes and their ornamental leaves. The coloured, heart-shaped flower of anthuriums is really a spathe or a waxy, modified leaf flaring out from the base of a fleshy spike (spadix) where the tiny real flowers grow. The anthurium flowers appear as a roughness on the spadix as compared to a smooth spadix. The most common colours of anthuriums are red, pink, orange, yellow, white and green. The plant’s stem lengths may grow to a height of 15-20 inches depending on the size of the spathe, ie, the bigger the spathe, the longer the stem. In 1889 the first anthurium was brought to Hawaii from London by S M Damon. After 100 years of cultivation and hybridisation the Hawaiian anthurium is considered Hawaii’s principal ornamental export. In 1959 Hawaii produced 2.6 million flowers for export to Italy, Germany and Switzerland. These countries could not produce enough anthuriums to meet international demand creating a unique opportunity for TT to exploit. Anthuriums are grown for their showy bracts or spathes, which are popular with the cut flower trade. These attractive “flowers” give bright colour for six-eight weeks or more each year. Often admired as houseplants for their budget, year-round flowers, anthurium plants are relatively hardy and easy to care for when kept indoors. 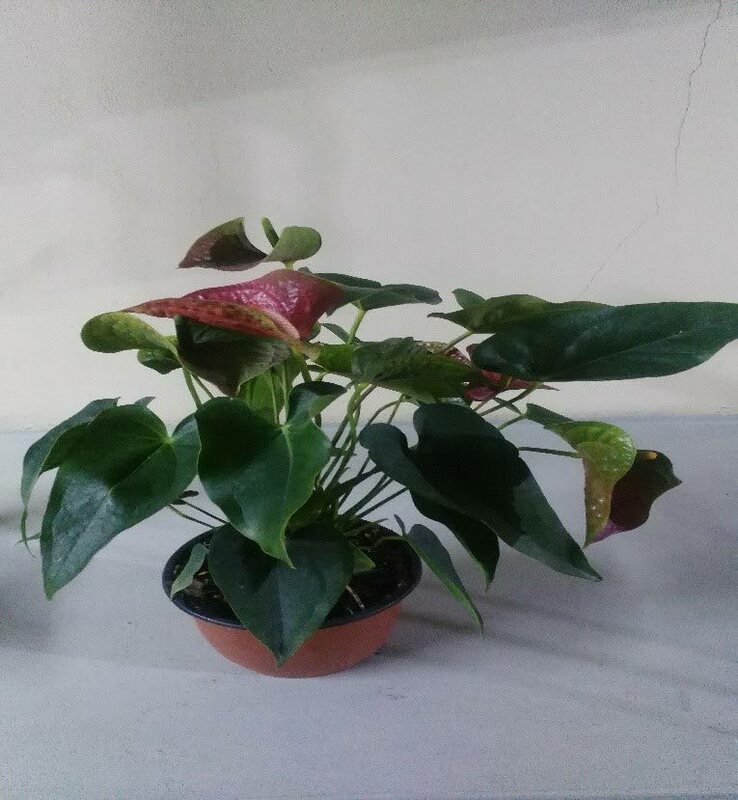 However, do note that all parts of the anthurium plant are poisonous (the poison is calcium oxalate) so ensure pets and children do not interact with them. If ingested it may cause mild stomach disorders and the anthurium plant’s sap can cause skin irritation. • Plants grow best on a well-aerated organic medium with good water retention and drainage. A layer of coconut husks, semi-rotted wood, or sugar cane bagasse may be used allowing the roots to grow into the mulch and spread. • Anthuriums need a high light but not direct sunlight therefore the planting area in your garden should be chosen accordingly. The plants should also be protected from windy conditions. • Anthuriums should not be planted more than 5cm deep, as deep planting results in the rotting of stems and roots. Stake the anthurium after planting for support. • Water the anthuriums immediately after planting and thoroughly thereafter but allow them to dry slightly between watering. Do not over-water as it may cause root damage and yellowing of the leaves. Anthuriums prefer a coarse well-drained soil, our local mixture of peat moss coconut chips and perlite is fine. Place the pot in a position where it will get indirect sunlight and out of strong draughts. Water when the soil is dry to the touch and fertilise with a quarter strength fertiliser every three months.